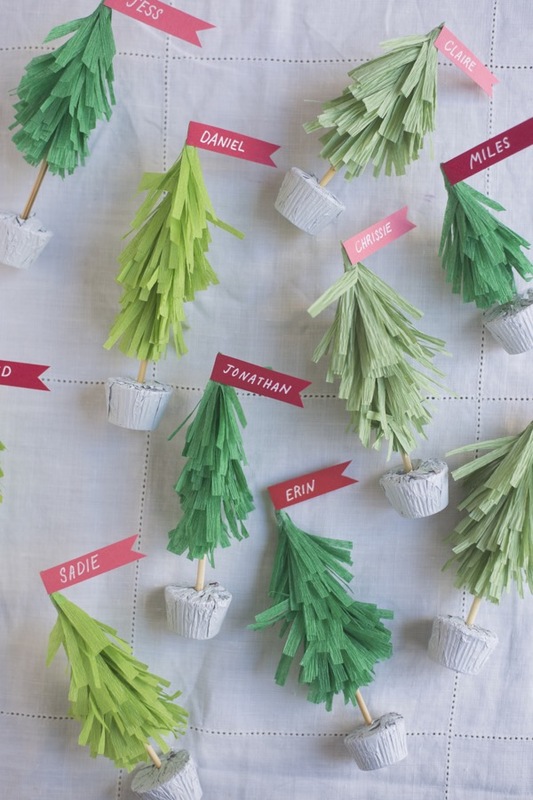 Crepe paper pine trees make the cutest little name cards for your holiday dinner – group them together afterwards and you have the most charming forest as your table decoration! 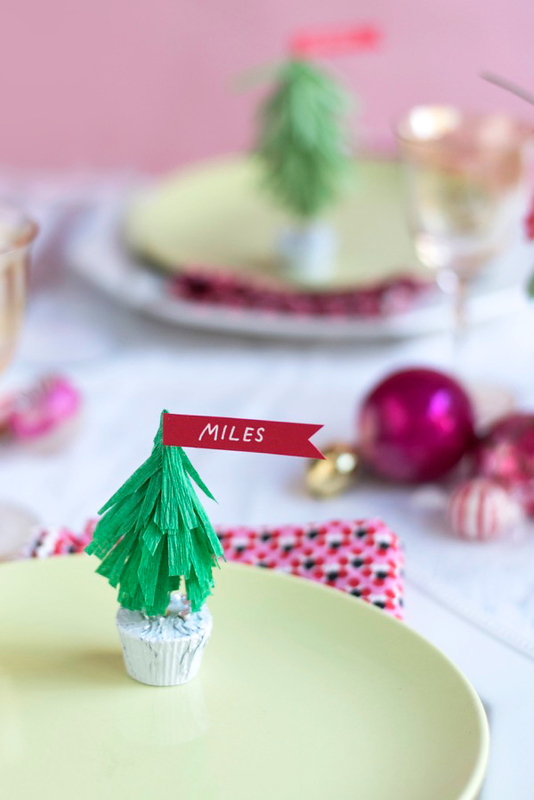 These don’t take long to make at all, and the best part – the base of the tree is made from a mini chocolate peanut butter cup. You may or may not have to “test” the chocolate as you make them – you know, to make sure they’re OK! Just saying. 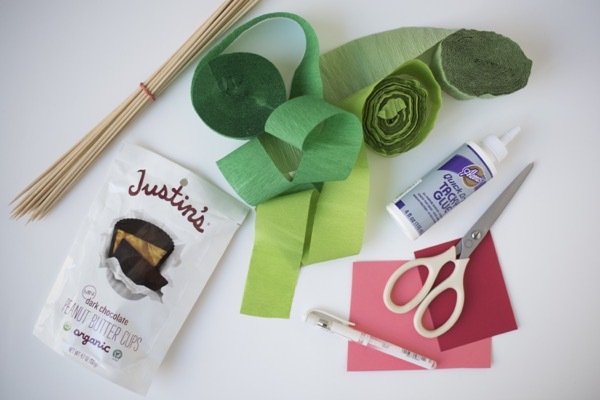 Materials needed: green crepe paper, bamboo skewers, scissors, red and pink cardstock, white ink pen, Justin’s Mini Peanut Butter Cups. Step 1: Cut a skewer about 4 1/2 inches, keeping the pointed end to use. Step 2: Take a 2 foot length of crepe paper streamer and fold in half. Fold in half again, and again one more time. Step 3: Cut fringe into the length of the strip. Step 4: Lay the roll of fringed paper flat, and apply dabs of glue along the solid side. Step 5: Starting halfway up the skewer, with the pointed end at the bottom, begin rolling the fringe UP the skewer. At the top, twist to make a pointed tip. 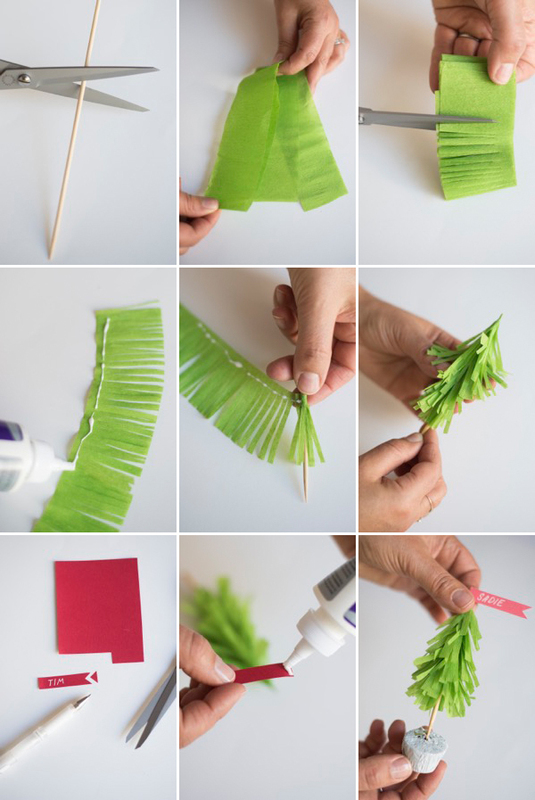 Step 6: Gently fluff up the crepe paper to create the shape of the tree. 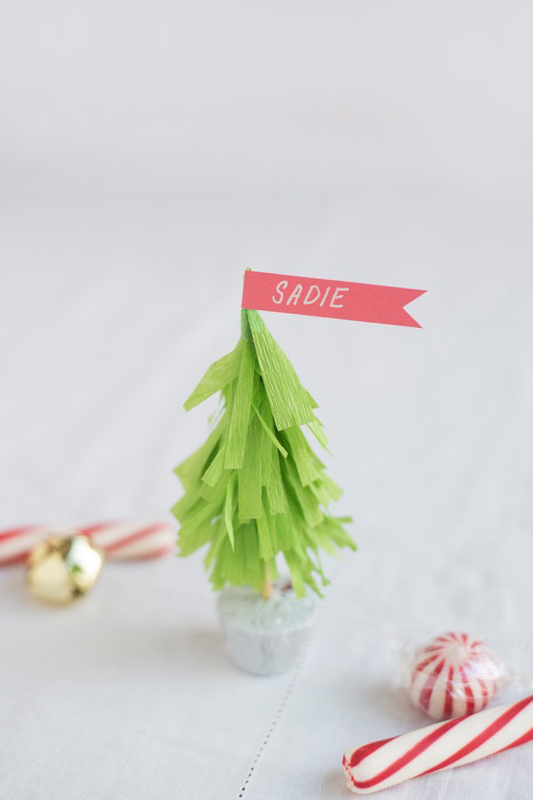 Step 7: Cut out a small (1/2″ x 1 1/2″) paper rectangle, write guest’s name on it. Step 8: Attach the name tag, with a dab of glue, to top of tree. Step 9: Insert skewer into Mini Peanut Butter Cups as the base of the tree. I don’t think you understand how CUUUTE!!! these are!! Thank you for another great idea! I’ll for sure make these for place settings!! I adore the printables you have as well! Keep ’em coming! Enjoy your holiday!!! 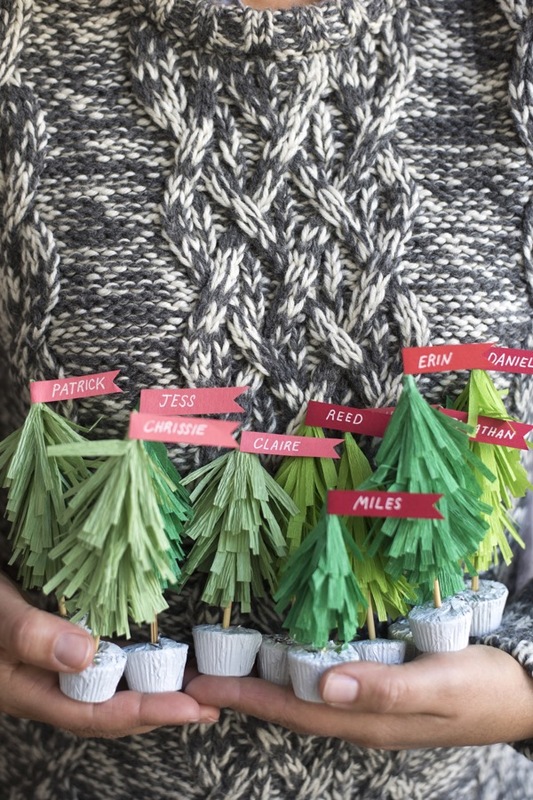 Those are too cute, I need to make them for Christmas! I like the fact that they are stuck on peanut butter cups! These name cards are so cute! You always come up with the best projects! Seriously?! These are adorable!!! I will be making these! SO cute! I really want to try them out! 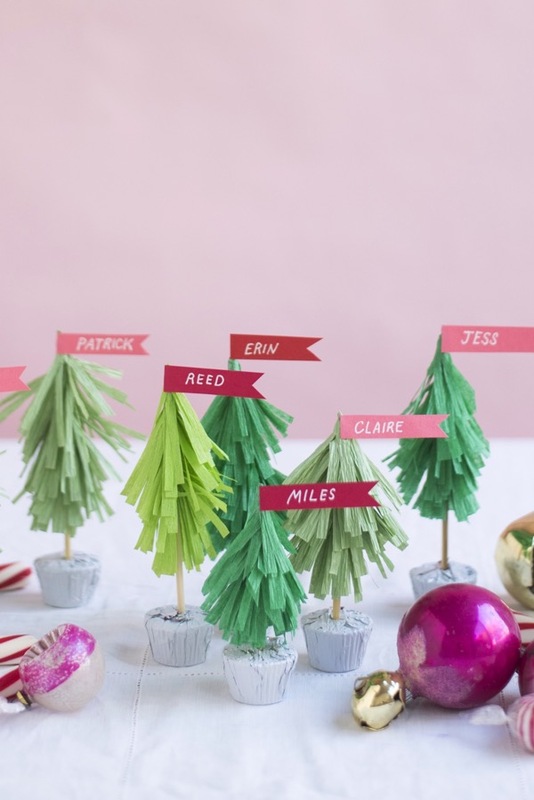 So cute, just had to save them to my Pinterest Board Christmas Time! So cute! Love the little “tree stand” peanut butter cups! Those are super cute I will have toy try making them this year!! So festively cute. Nice job. So cute! I love that the base is a little peanut butter cup! This has got to be one of the cutest things I’ve seen! 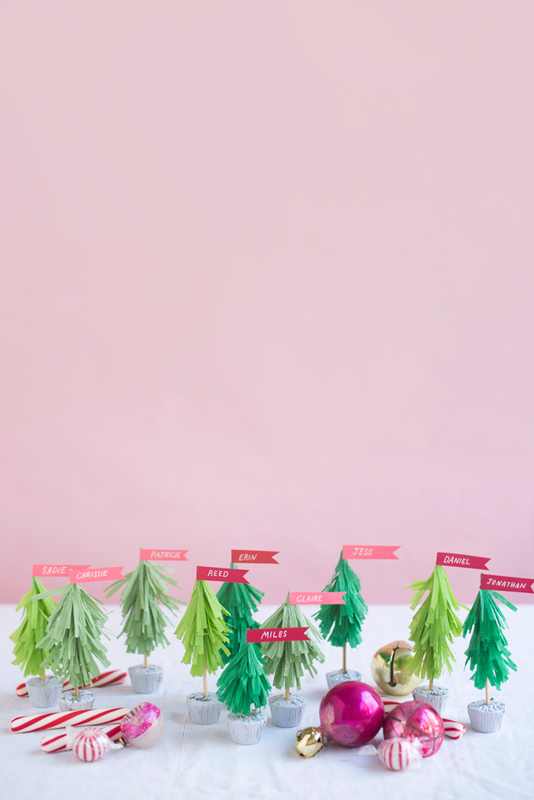 ?ill definitely be doing this for my twins’ enchanted forest party. May I ask where you found those streamers (in those colors)? I looked online and didn’t see the same colors. Thanks! I think I got them at Party City. Sometimes the dollar store will have good colors too. Love this idea! Do you know about how many mini peanut butter cups come in a bag of Justin’s brand? I think there are 8 or 9 in each bag.